Over the years, I have been trying to build up a list of Thames Streets and any changes.﻿ Yesterday, by chance the name of another street has emerged, that of KNEEBONE STREET. A relatively new newspaper called the PENINSULA PRESS, contains articles by Meghan HAWKES. Meghan - called "Hawkeye: Coromandel snippets" and "Dead Cert" which looks at the names behind the headstones. Below is the article that was referred to (Evening Star 26/11/1881), it discusses the recent flooding on 25 Novemeber 1881 that affected ALBERT and KNEEBONE Streets. 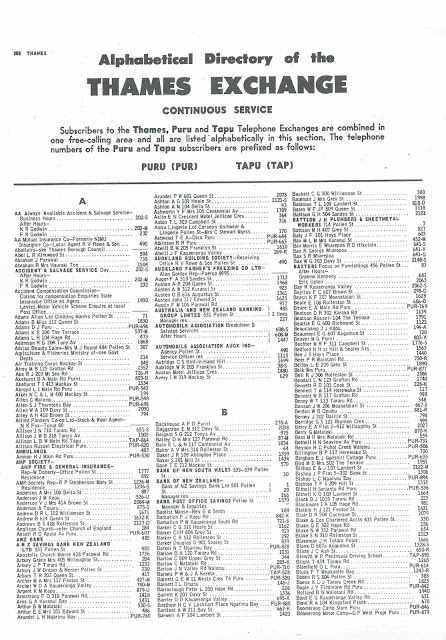 Online auction sites often have phonebooks for sale, of verying ages. These can be an excellent source of information regarding family and business location, often with specific address details. Copies for Thames can be found at The Thames Library and The Treasury, Thames also hold several old editions. 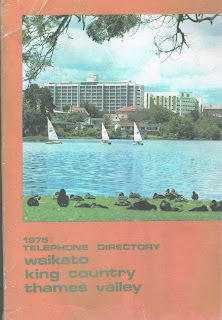 Below is the cover of the 1975 edition that will bring back memories for local folk and a page from that directory. I hadn't explored Youtube for Thames information, until I needed a place to put my Thames Postcards Video, but already today I have found a couple that may be of interest, particularly to the rail enthusiast. 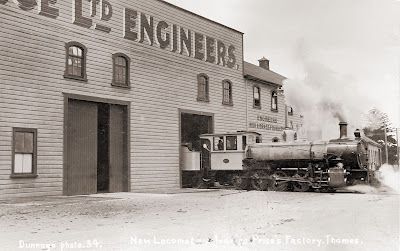 Two videos back in the 1980s of a train from Paeroa to Thames, then pulling in and leaving Thames Railway Station. They bring back alot of memories and will be of interest to show newcomers and younger folk, just how important trains were to Thames! When Thames had a railway Part 1 - At 5.30 min you cross the Kauaeranga River Rail Bridge into Thames, past Toyota Car factory and stop at the Shortland Wharf. 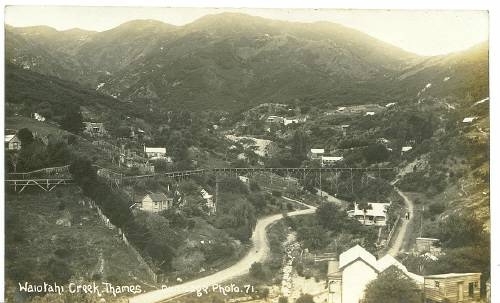 When Thames had a Railway Part 2 - shows coming into the Thames Railway station and then views back from the wharf. Later showing the train heading back out of town. The subject of the present sketch is His Worship the Mayor of Thames, and also M.H.R. for the Thames Electoral District, William Fraser, Esq. He is a gentleman of good physique and commanding appearance: at one time the holder of responsible positions under the General Government, and latterly in all of our local governing bodies. When Warden and Resident Magistrate for the Thames Goldfield, he suddenly, and for some reason or,other not made public, resigned these positions, it being, however, currently reported at the time that, he preferred no investigation of the matter. He served a term as Councillor in the Thames County Council, being one of the representatives of the then Ohinemuri Riding in that body; and while there he was credited with getting a wharf erected on some ground in which he was interested. At present he fills the responsible office of Mayor, having been unanimously elected to that position for the last three years. This has not been altogether a bed of roses, as he has had to defend one suit in the Supreme Court in consequence of his some what arbitrary ruling as head of the Council.
" Folly is not always folly : it depend/oti the character of those who handle it." "
immediately afterwards was elected Chairman of the County, which position he has continued to fill up to the present time, all attempts to oust him therefrom reuniting in failure. Being well conversant with the laws of the Colony, especially those relating to Counties, Finance, and Public Works, he is by many considered the beau ideal of a County Chairman. His burly and genial figure is perhaps better known in Wellington than that of most Honorable Members, as for some five years it was the custom of the Council over which he presides to send him down to the Empire City during the session to look after their interests; and it is generally believed that he netted more spoil for his County by these periodical trips than any ordinary member of the House. Of late, however, the finances of the County have not been in a sufficiently flourishing condition to allow of the trip, and special votes and grants have necessarily, therefore, not been as plentiful as of yore. Mr Brodie is endowed with a good share of common sense, also a fair amount of ability, and possesses the comparatively rare merit in a public man of being able to keep silent when circumstances require it. In the pursuit of an object for the benefit of the County, or for his friends, the means adopted by him may sometimes be considered as open to adverse criticism by the censorious and strait-laced, but to all such opinions he is supremely indifferent to long as the end in his opinion justifies the means. He possesses qualities which fit him for a much higher position than County Chairman; as a party man he would be invaluable both to his party and to his constituents. 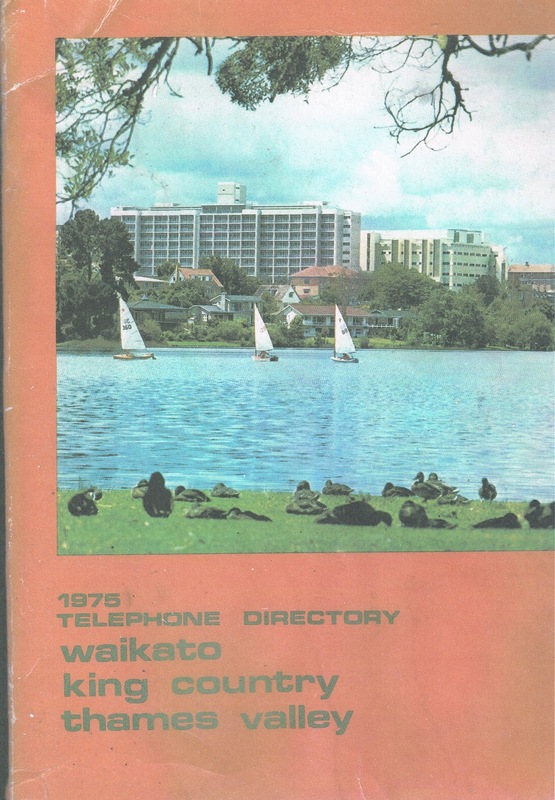 On two occasions he unsuccessfully contested the Coromandel Electorate, his candidature being damaged by the idea which was abroad that he was the nominee of a party— hence (to the undoubted loss of this district) the electors would have none of him. A lack of that quality which makes a public man lo be depended on has always stood in the way of his advancement, as he bears the reputation of running with the hare and hunting with the hounds. He is a peculiar mixture—being most susceptible to public opinion, yet often doing that which the public condemns. He likes to be on the winning side, and therefore is often reticent when his friends are spoken ill of, lest by taking their part he should peradventure be on the unpopular side. He can dissemble, and therefore be apparently friendly with the man he despises. Undoubtedly a first class interviewer—so good indeed as to have earned the soubriquet of the " Sturdy Beggar "—he is exceedingly tenacious; not easily refused, and consequently generally makes the best of any case be may have with Ministers. He it the terror of Under-Secretaries. He has undoubtedly done good work for the County, of which he is the head; and if they did not make a better use of the money obtained by his skilful management, he certainly:should not be blamed for it —any more than the maladministration of funds by Government should be laid upon Vogel, whom he in some respect resembles. Mr Brodie's ingenuity and pertinacity were well exemplified in his efforts put forth to prevent the dismemberment of the Thames County by the secession of the Ohinemuri portion of it. The inhabitants fought hard for separation, and many a time victory seemed almost within their grasp, but only to be wrested from them by some little error or legal technicality, while all the time Mr Brodie never appeared in the matter save than as County Chairman, and as always willing to comply with the wishes of the people. Mr Brodie is essentially a social individual; sometimes even convivial; is always polite, always attentive, but not always sincere. A useful member of society, taking a prominent part in all matters affecting the public welfare, and ever on the alert to secure benefit for the community, as a whole. In the pursuit of material wealth, careless and indifferent; unselfish by nature, and liberal to a fault. Altogether a man, who if not as successful in the race of life as his friends believe with his abilities be might have been, yet one who possesses many of the virtues neutralised by some of the weaknesses of humanity, but still one who would be greatly missed upon the Thames. May his shadow never grow less! A new section looking at specific characters of Thames, started with a chance find of three biographies in the Thames Star Newspaper 1886. The first is on HARRY KENRICK. "In the sketch above, our readers will easily recognise the features of our respected Warden and Resident Magistrate, who succeeded Captain Fraser—now our; M.H.R.—in these responsible offices on the Thames goldfield some years ago. Being somewhat of a martinet, his advent was looked upon with considerable suspicion by the several officials connected with the Government service here and these same gentlemen for some considerable time felt ill at ease, and believed themselves to be suffering a kind of mild persecution. Accustomed to the bonhomie style of his predecessor, they could not understand the strict order insisted on by the new power. This arose more from the change than from any real cause; but being capable officers they soon found that the new Warden had no feeling in the matter, save that of doing his duty, and the result is that these very officers not only bare now no fault to find with their superior, but really respect him. His nature is not such as to engender affection in his subordinates: respect him they will, but regard him with affection, never. His conduct throughout unfavorable circumstances has always been characterised by a desire to deal fairly and uprightly with all parties. No man can be entirely free from forming, or being the cause of forming coteries or circles, and generally tag best men are, through their very good-nature, the most liable to form such associations. Mr Kenrlck has been singularly free from this. Although courteous and obliging, he will rarely, if ever, be found going further. Occasionally in his judgments he is prone to follow the course of some judges in accompanying the sentence with advice, and this in cases,where the full sentence has been imposed somewhat exceeds the bounds of fair play. As a Warden he will be respected, and his decisions generally depended on. As R.M. his judgments are according to his lights, and honestly given. Personally, a self-contained man: bitter and continuous in his dislikes, having little sympathy for an opponent. Shrewd and cautious, his feelings are easily hidden. Phrenologically, the mental qualities predominate, and become easily accustomed to routine or order. A fair man: a valuable executive officer, possessing the enviable qualities,of being trusted by Government, and regarded with confidence by the mining community. A name of interest for me, was that of my Great-Grandmother, Honor PASCOE. Honor WILLIAMS was born 31/5/1862 at St Just in Penwith, Cornwall in England. The daughter of John and Elizabeth WILLIAMS. After her father died, Elizabeth and her three daughters emigrated to NZ, leaving Plymouth 5 June 1879 and arriving on the "Glenlora" into Lyttelton 30 August 1879. On 15/2/1871 at Timaru, Honor married another lad from St Penwith, Benjamon Eddy PASCOE. They moved to Napier around 1893, then onto Waihi, where Honor died 11/10/1939. Her husband Ben, then moved to Thames where he lived until his death on 23/6/1945. In "To Find a Fortune" by R Killip, there is a section on the Right to Vote. Thames women were vocal on the need for women to have the right to vote and this was witnessed at meetings held by groups such as "The Thames Literary and Debating Society" where the speakers were mainly men, but women attended in great numbers. Women such as KATE CAUSLEY, who was a teacher at Thames High school vocally affirmed her support for women's franchise. Thames women signed the 1892 and 1893 petitions for women's suffrage, a cross-section of society signed the petition, from single to married women, to those involved in domestic duties to those who were employed outside the home. There were 13 petitions, most details lost. What an exciting time it must have been for women, when the right to enrol came in force September 1893. 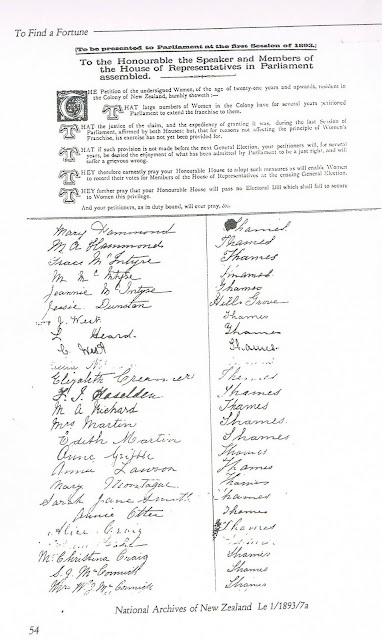 All persons over the age of 21 years who had resided in the colony 12 months and in the Thames District for three months were entitled to vote. Mrs PURNELL made a statement at a local meeting that was reported in the Thames Star 8/11/1893, detailing the 12 reasons why women should vote. The majority of the streets that were established and named in the early days of the goldfield, still exist largely unchanged today. In 1867 it was quickly apparent that James MACKAY needed to lay out streets for the new town of Shortland, to prevent the haphazard placement of tents, shops and random buildings. 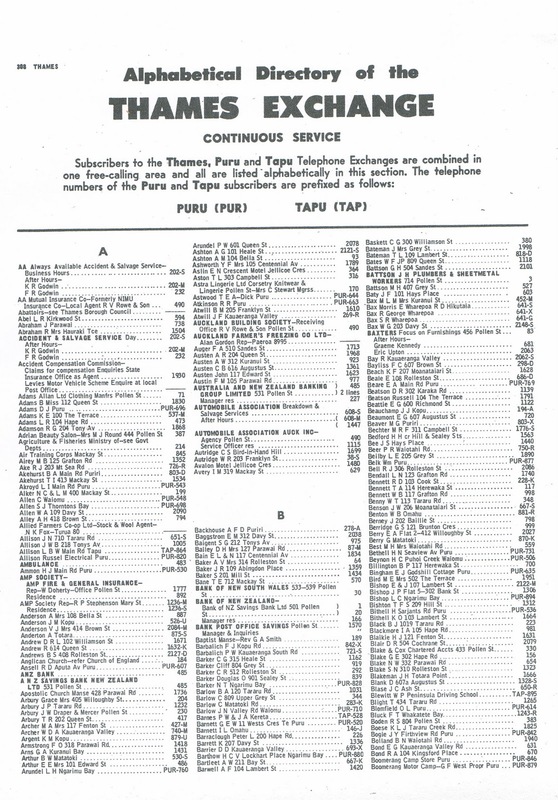 A standard grid layout was utilised. A summary of these and name changes has already been discussed. Today the example is BAILLIE STREET, which originally ran in the north from Bella Street (just below Bird-in-Hand Hill), southwards right down to Mackay Street (at the Grey Street intersect). 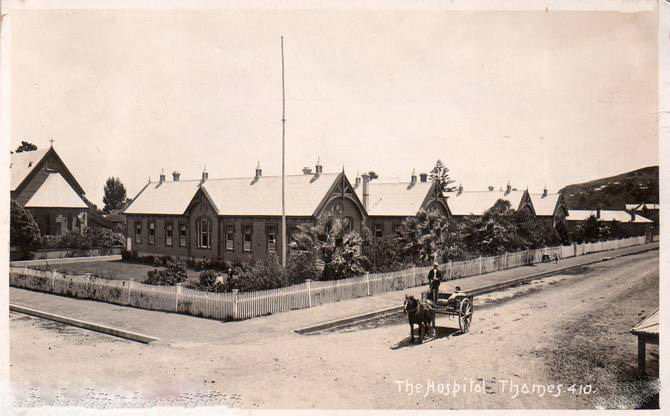 The building above is the Thames Hospital in the early 1900s. In the 1950s when hospital redevelopment was necessary this portion of Baillie Street was closed. The part of Baillie Street that ran through the High School was also closed, to allow more development and land use by the High School. The portion of Baillie street between Mary and Sealey street was renamed as COURT STREET, the short street that runs past the Thames Bowling Club. Today a portion of Baillie Street remains between Richmond and Mackay Street. 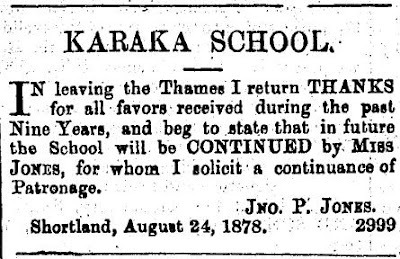 Different sources give the names and locations of schools slightly differently, needless to say if you can't find your relatives in the school records that still exist, it certainly DOES NOT mean they didn't attend any school. There were many private schools in Shortand and Grahamstown (Thames), miners and business folk alike, seemed very keen that their children received an education. In the Evening Star 26 August 1878, there was a thankyou note from Mr JONES of the KARAKA School, informing that he was leaving Thames and that Miss JONES would be continuing. He thanked people for their patronage over the last nine years - making the opening of the school c1869.